When his hand fell back down onto the bed his eyes were half closed. My right hand held his head, my left pressed his chest. No breath passed his lips, his heart had stopped beating..."
The church of the Holy Trinity- Dreifaltigkeitskirche - in which began Beethoven's funeral ceremonies on March 29th 1827. 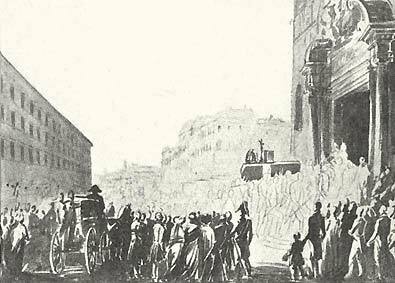 On the afternoon of Thursday March 29th 1827, between 10,000 and 30,000 people united in front of the Schwarzspanierhaus for the funeral of Ludwig van Beethoven. 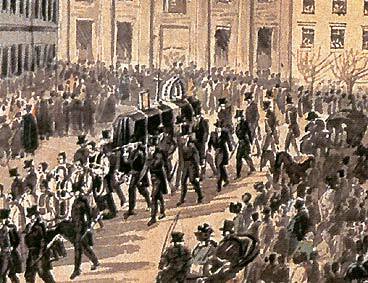 About 20,000 persons were here; that means a tenth of Vienna's population came to see the coffin beeing carried to the church. It has been said that never before, so many people gathered, in Vienna, for someone's funerals. Two plaques, situated on the outside, remind us that Beethoven and Schubert both had their funerals held here. The actor Heinrich Anschütz, read the funeral oration written by Franz Grillparzer (a great writer), in front of the doors of the Währing Cemetary. 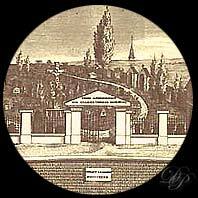 Beethovens body was exhumed twice; in 1863 - in order to preserve the remains better in a metal coffin, and where photos were taken of his skull and on the 22nd of June 1888, when his remains were transferred to Zentralfriedhof (experts were given 30 minutes to examine the remains). 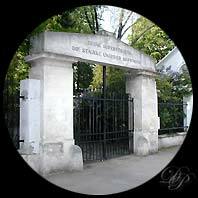 Today Währing cemetery has been transformed into Schubert Park.The original tombs of Beethoven and Schubert are still there - those which were erected at their deaths. 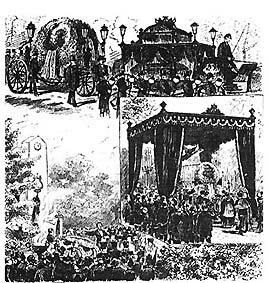 Left: Beethoven's exhumation in 1888. 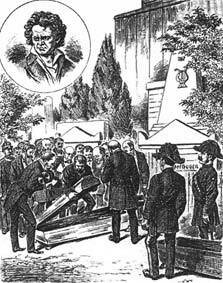 Right: Beethoven's remains are transferred from Währing to Zentralfriedhof.